JP5 – Jang Speed Seeder No. 5 – THE COMPLETE KIT – Paperpot Co. The Complete Kit comes with everything that you need to get started using your JP5 right away – it’s all in the box! 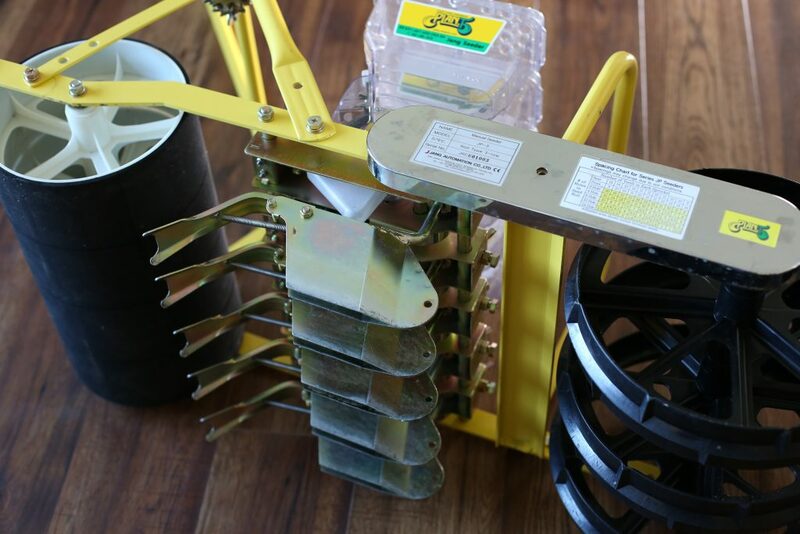 Kit includes JP5 seeder with 5 hoppers, 5 narrow shoes, and 15 total rollers – 5: LJ24, 5: X24, 5: F24. You won’t have to order anything else! Since the JP5 requires 5 rollers at a time, we have included a limited amount of rollers to save upfront cost while still giving you maximum crop diversity. 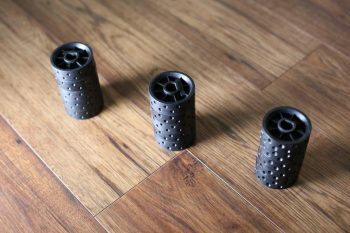 Simple sprocket changes allow you to use the included rollers in a variety of ways. There are FOUR variables to adjust when operating the JP5: the rollers, the gears, the number of rows per 30-inch bed, and the hopper brush, which is the little brush inside of the hopper which controls the amount of seed flowing from the roller. *When adjusting your hopper brush, we suggest only opening it all the way up and all the way down. In the chart that’s what we are referring to. 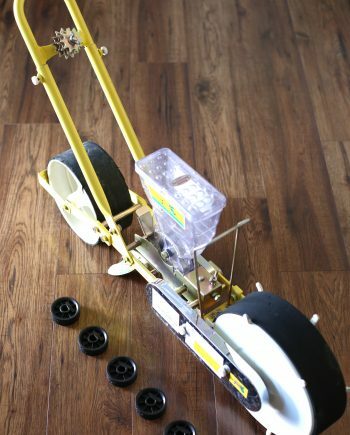 The JP5 speed seeder gives the ability to accurately and quickly seed 5 rows at a time. The JP5 takes everything that is great about the single row JP1 and makes it better and faster! Out of the box, it comes with 5 complete row assemblies and hoppers giving you a versatile multi-row seeder best used for high-density crops like salad greens and baby root vegetables. 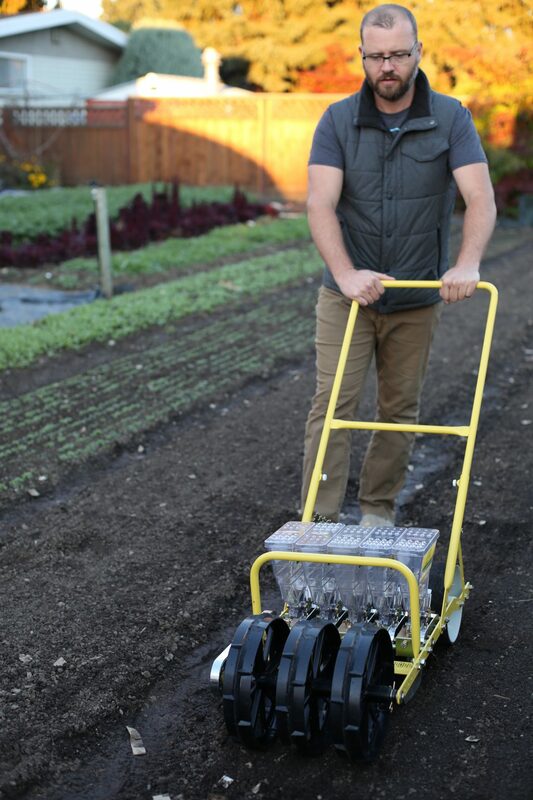 With the JP5 you can quickly plant up to 10 rows with just 2 passes on a 30″ bed. Other combinations are possible as well. 6 rows can be just as easily planted by taking out two hoppers. We have found that most crop combinations for baby root veggies and leafy greens can be achieved by either 6 or 10 rows. There are a wide variety of rollers available for the JP5 that can cover seed sizes from carrot to peas. Jang seeders have become an industry standard for market farmers all around the world due to their ability to perform well in all soil conditions while being used for a wide variety of crops. The JP5 is made in South Korea and its quality is second to none. The heavy-duty construction will keep it going year after year, unlike cheap Chinese knockoffs. If cared for and properly maintained the JP5 will last a lifetime and like be the only single row seeder that you ever buy. Narrow shoes (1/2″ wide versus standard 1 3/8″ wide) to help reduce soil drag, plowing of soil, and excess buildup of soil between each of the 5 shoes. WHO IS THE JP5 FOR? The JP5 is intended for growers who are planting a lot of high-density crops with long beds. If you’re using 100’ beds or more, this machine will save you a lot of time walking up and down the beds to do multi-row crops. The other advantages it provides is speed, accuracy and the fact that you don’t need to have perfect bed prep in order to get the accuracy. Unlike the 4-Point and 6-Point seeders, the JP5 can operate in less than ideal soil conditions and bed prep and this becomes a huge time saver over the course of a season. If you’re harvesting your greens with a Quick Cut Greens Harvester (QCGH), the JP5 pairs very well because the planting pattern is 13” across, so you can leave 1” or more between passes and that means the QCGH will cut perfectly within the planting pattern, getting a clean harvest from edge to edge. The Jang ships from a third party shipper, and when you receive your Jang JP5, the only assembly required is to place the handle onto the main body. 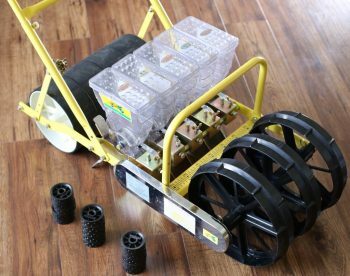 *Rollers must be purchased separately and this unit requires 5 of the same roller if you want to plant 5 rows at the same time. The JP5 will not work without rollers.